Important views on the origin of life, modern concept of origin of life, Oparin Haldane theory, coacervates, Miller and Urey experiment. The Big Bang theory states that, the Universe was once in an extremely hot and dense state which expanded rapidly. This caused a massive explosion throwing out hydrogen atom and related nuclei which became organised to into galaxies. In our galaxy the "milky way" the solar system probably arose as a swirling cloud of gases that condensed to form the sun and the planets. This cloud of gases is called nebulae. Nebula separated to form galaxies. Among the spinning mass the central mass formed the sun and clouds condensed to form the planets. Original temperature was about 5000 to 6000 degree C.
Elements like hydrogen, carbon and nitrogen could not exist in free state. Thus the atmosphere was composed of ammonia, methane, steam, carbon-di-oxide and free hydrogen. According to this theory all living organisms were created by some supernatural power. These forms were designed according to their surroundings suddenly. These have existed unchanged from the time they were formed. According to this theory the earth has undergone several catastrophes or destruction. After every destruction God created a new living world. This theory stated that living things originated abiogenetically from non-living material. Anaximander and Aristotle were the profounders of this theory. According to them, insects arose from dew, frogs and toads from muddy bottom of ponds, butterflies from cheese etc. Van Helmont stated that young mice could arise from wheat grains when these were put in dark rooms with a moist dirty shirt. However, this theory was experimentally rejected. Francisco Redi, Abbe Spallanzani and Louis Pasteur, experimentally disproved the theory of abiogenesis. Fransisco Redi cooked some fish to make sure that there were no organisms left alive. He then placed them in three jars, A, B and C.
He left the jar A uncovered, jar B was covered with a fine muslin cloth and jar C with parchment paper. He kept them for a few days, he observed that maggots appeared only in jar A. He thus concluded that flies arose only from the egg laid by the parent flies in the uncovered jar. On the basis of this he disproved the spontaneous generation of life. Louis Pasteur took a flask and filled it half with yeast and sugar solution. He softened the neck of the flask by heating it and drew it into S shape (swan neck flask). He then boiled the solution till the steam passed out through the tube. It was then allowed to cool and kept for few days. He did not find growth of any organisms. Then, he broke the neck of the flask and found growth of microorganisms. The S neck of the flask prevented the air-borne particles from entering the flask and thus there was no growth. However when the neck was broken, the direct contact of air with the solution made it possible for the microbial growth. 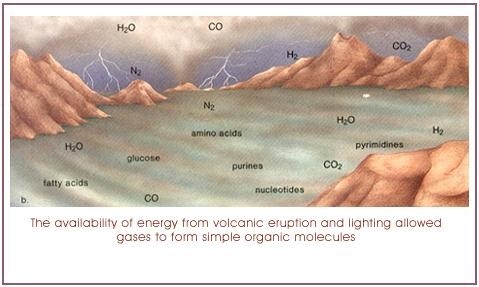 Oparin and Haldane’s theory of origin of life. Life originated in water bodies by chemical evolution. Spontaneous generation of life in primitive atmosphere. First living beings arose from simple inorganic and organic compounds. How could life originally arise from non-living matter? 1. Formation of simple organic compounds. After cooling, the primitive inorganic molecules of earth interacted and combined with one another to form simple organic compounds. These were in the form of simple sugars, fatty acids, glycerol, amino acids and nitrogen bases (purines and pyrimidines). Water vapour present in the primitive atmosphere formed the clouds, resulting in continuous rainfall for several centuries. This rain water filled the hollows and basins of the earth's crust to form the oceans. Water in these oceans contained ammonia and methane. These compounds reacted among themselves to form the primitive organic compounds, which had carbon-carbon linkages. Thus, ocean water provided the basis for formation of organic compounds. Simple sugars combined form complex polysaccharides (starch, cellulose). Fatty acids and glycerol molecules combined to form lipids. Amino acids combined forming polypeptides and proteins. Purines and pyrimidines combined with simple sugars and phosphates to form nucleotides, which then formed nucleic acids. Miller and Urey recreated probable conditions of primitive earth in the laboratory. The effect of lightening of primitive atmosphere was created by two tungsten electrodes connected to an electric source. A large flask was connected to a small U tube passing through a condensor. A chamber containing HYDROGEN, AMMONIA, METHANE AND WATER VAPOUR was created representing the primitive atmosphere. Another chamber with water was kept that connected to the atmospheric chamber by a tube. This chamber was provided heat by a burner and this represented the oceanic chamber. The vapours from the oceanic chamber reached the atmospheric chamber and the condensed liquid was collected. This liquid when tested contained amino acids.This confirmed the possibility of abiogenesis. These then formed complex molecules by condensation and polymerisation. Synthesis of carbohydrates, fats and amino acids occurred in the sea by condensation and polymerization. Oparin and Fox proposed that the complex organic molecules synthesised abiotically on the primitive earth formed large spherical aggregates. These remained suspended as droplets in sea water. These colloidal aggregates are called COACERVATES. Coacervates are cluster of complex organic molecules bound by fatty acids and divide by budding. The coacervates had all the basic properties of living cells like, metabolism, growth etc. However they lacked the complexity of the living cells like, ETS, enzymes etc. Thus these particles with proteins as enzymes and ATP as source of energy were the first abiotic structures at the margin of non-living and living. Coacervates changed to the first living system, called protocells, eobionts or protobionts. Protobionts are the first cells containing self reproducing molecules enclosed in a lipid membrane. These were formed after coacervates and before the actual cells. Is abiotic synthesis possible today? It is not possible today. Free oxygen would destroy most intermediate products. Today life comes from pre-existing life. The coaceravates started absorbing organic substances and became anaerobic heterotrophs. Nucleoproteins appeared in the primitive ocean as self replicating systems. These were capable of hereditary function. Thus the first organisms were heterotrphic, anaerobic and virus like nucleoprotein structures. These were comparable with bacteria of today. These organisms consumed all abiotically synthesized organic nutrients of the oceanic soup. During this period some organisms acquired enzymes for catalyzing simple carbohydrates from organic substances. This was the beginning of autotrophism. The early autotrophism is said to be chemoautotrophism. These organisms can be compared with the deep sea sulphur bacteria. Some autotrophic bacteria managed to synthesise chlorophyll like green pigments that could absorb sunlight. This bacteriochlorophyll underwent certain molecular structural changes forming true chlorophyll. These chlorophyll bearing prokaryotes can be compared to present day blue green algae. Liberation of free oxygen into the primitive atmosphere by blue green algae changed the earth. The reducing atmosphere became oxidizing. Thus primitive atmosphere changed to present day atmosphere. The prokaryotes developed a true nucleus and other organelles to form free living eukaryotic cell like organism about 1.5 billion years ago.